Over the last 40 years, Living Archive Milton Keynes (LAMK) has produced many community celebrations in art form of local people’s life experiences – from large-scale documentary musical dramas to broadcast radio ballads. Over 100 songs have been composed for them by local musicians, all written about people who have lived in the area, most of them from before it became the New City and Borough of Milton Keynes in the latter part of the 20th century. The earliest setting of a song in the archive is from the Middleton Parish (Milton Keynes Village) in the 18th century, taken from court records chronicling the colourful life of a local girl; but most songs are sourced directly from the interviews conducted by LAMK over the past four decades – like Settling In, inspired by new Bletchley residents in the 1950s. The interviews include people who might have not only experienced the disruption of tumultuous times – war, hardship, social change – but also the protective blanket of their close-knit communities. Compilers Marion Hill and Craig McLeish have selected 36 of these songs, not only to share their origins and their special heritage, but also to create the first accessible collection of home-grown music, for use throughout Milton Keynes – especially in schools and community choirs. This website includes the background to each song along with a free download of the song scores. Alternatively you can order the complete Song Book – which has the same content – directly from Living Archive MK. 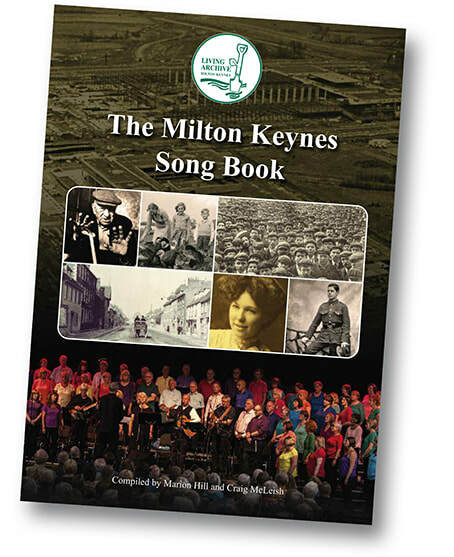 Welcome to the first Milton Keynes Song Book! Milton Keynes Community Choir conducted by Craig McLeish with the Living Archive Band (Godfrey Yeomans, Lors Featherstone, Marion Hill, Brad Bradstock and Chris Mitchell), at their MK50 concert 'All Change!' at the Ridgeway Centre, Wolverton on 29th July 2017.